"Lotto Winners Don't Always Collect. Some Numbers Are More Deadly"
UK retired couple Peter and Carmen Brown (former Lloyds of London finance brokers) who have sunk their life savings into the purchase of Stonehaven Manor Golf Club; an exclusive private golf resort located in the serene countryside just outside the sleepy village of Bangalow, New South Wales, Australia, are annoyed by a night of raucous partying from a guest Kristie Byrnes. But when Kristie fails to check out on time the following morning, Carmen Brown enters her room to find her dead; bludgeoned to death with a golf club. She is holding a Lotto ticket – half of which is missing! Detective Jack Creed is back in this thrilling Australian crime fiction seeking criminal justice, but sifting through the myriad of suspects including a no hoper ex-husband, a former childhood lover and a jealous, spiteful sister—all with secrets to hide—only makes this murder mystery more intriguing. Was it revenge, jealousy or money driven? Jack Creed has his investigation skills tested to the limit. 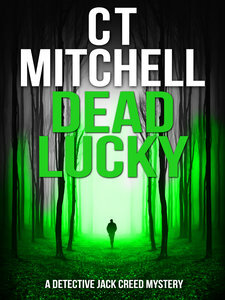 Following the hit UK launch, Detective Jack Creed Box Set, mystery novel Australian detective fiction author C T Mitchell has returned with his sixth international mystery thriller and suspense novella crafting a masterful web of twists and turns that’ll keep you hooked to the very last page. Strap yourself in for another wild ride Down Under. "........I couldn't pick the ending. C T Mitchell has the best mystery books!" Web Design and Development by Xsited. Copyright 2017, 2019 by C T Mitchell Books.